7 Conversations with Egyptian Uber Drivers: Why Emigrate? Why Canada? Census Canada recently estimated that the proportion of Arabic speakers in Canada is projected to increase 200 per cent by 2036. Yet, the study of immigration and ethnicity in North America tends to ignore Middle Eastern immigrants. The region remains in the Western imaginary as an ahistorical and hermeneutically sealed zone.1 However, one would be hard-pressed to find someone in Egypt today without a friend or relative who has emigrated. I visited Egypt for a six-week research trip in summer 2017, to compile documents from state and institutional archives on the history of Egyptian immigration to Toronto and the New York/New Jersey area in the post-WWII period. In the process, I often asked myself what my study of the history of Egyptian emigration contributes to our present understanding of Egypt and its émigré populations. The answer to that question began to form as I traveled throughout the country. On every excursion from a hotel, I requested an Uber. There are approximately 150,000 Uber drivers in Egypt and it is the most convenient and comfortable form of travel for visitors. Stuck in mid-day traffic, I would engage the drivers in conversation. After nearly three-dozen conversations, patterns emerged.2 The perception of emigration, its motivations, and the expectations of those wishing to emigrate have all changed in the past sixty years. 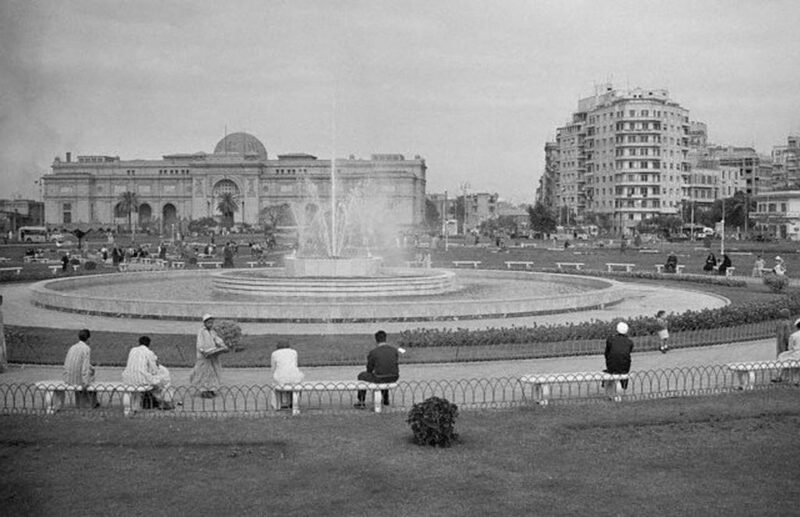 Cairo’s Tahrir Square, mid-1900s. Wikimedia Commons. When I interviewed a self-described “Canadian of Egyptian origin” in Toronto last spring, who had immigrated to Canada in the early 1970s, he recalled seeing his own migration as a journey from city to village.3 For him, as for many other Egyptians who began to emigrate to North America in the late 1950s, Toronto and Montreal were young, empty, and lacked the diversity of populations and services that characterized their city lives in Cairo and summers spent in Alexandria. They recounted that the streets of Cairo and Alexandria rivaled those of Paris and were the envy of western Europe. The factors that once prompted many to emigrate were quite varied. First, the expanding post-secondary educational sector and private enterprise in Canada provided an endless array of opportunities to succeed. Second, their youthful sense of adventure; of exploration and dreams of self-made success. Third, fears of President Gamal Abd’ al-Nasser’s secret police and of being drafted into yet another regional war. The majority of émigrés up to the late-1970s were of middle-class backgrounds in Egypt and still remember a prevalent sense of dread that continued military spending would further cripple the national economy. Yet, almost thirty interviewees to date have described their decision to leave as one of many options; whether pursuing higher education, youthful adventure, or job security and social mobility, most maintained the option of eventual return to Egypt years after their arrival. Unlike the documented migrations of many ethnic groups in Canada, such as the Greeks, Italians, and Portuguese, the early immigration of Egyptians was not related to chain migration. Those who left knew very little of what life would be like in Canada and relied on mail and telephone services (routed through England) to maintain contact with their families. In time, the growing popularity of air travel shortened the distance and, alongside innovations in communications technologies, lessened the sense of separation and alienation in a new environment. By the late-1970s, military conflicts in the region and President Anwar al-Sadat’s Infitah (opening up)–a 1973 liberalization scheme that opened the economy to foreign investment and private enterprise–further eroded the middle-class and increased the gap between rich and poor. Throughout the 1980s, North America drew in Egyptian immigrants with the majority choosing Toronto or Montreal in Canada (depending on their language proficiency) and New York/New Jersey or Los Angeles in the United States. President Hosni Mubarak’s tepid approach to social and economic change increasingly caused those qualified immigrants to leave for better opportunities abroad. Where Canada’s immigration policy remained tied to qualifications based on skills and training, the United States introduced the Green Card Lottery in 1996, and emigration from rural villages in Upper Egypt vastly increased the proportion of that country’s Egyptian population. After the failures of the 2011 and 2013 revolutions in Egypt to produce qualitative social and political change, emigration is now highly sought-after. Conversations in Egypt this summer always began the same way. The driver would inquire: “where are you from?” Maybe my slightly out-dated way of speaking Arabic gave me away. Or, maybe, it was the way I dressed: in shorts, rather than jeans, to alleviate the scorching heat. Yet again, it may have been the fairness of my skin, from too many Canadian winters. Whatever the case may be, none of the drivers accepted my claim that I was visiting Cairo from my hometown of Alexandria, where I was born and raised until my family chose to emigrate in my youth. I would then share that I was living in Toronto, Canada and was visiting to collect sources for my research. Every driver, without fail, would then relate how he had a friend or relative in a North American city and plans to emigrate. 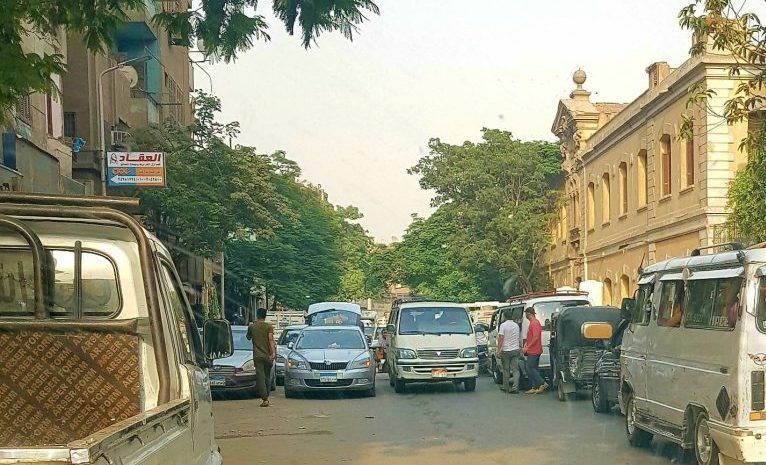 Typical traffic congestion in Cairo, as pedestrians, commuters, and standing traffic vie for space. Author’s photo. Hemmed-in from every corner, many have applied several times and have been rejected. Now they are on their fourth or fifth try and await anxiously for a positive reply. Gone are the notions of youthful adventure. Gone is the idea of eventual return. What they see ahead of them as immigrants is a life of hard work, living paycheck-to-paycheck, supporting a family, and putting their kids to school; similar to their daily life of work, family, and community in Egypt. In fact, many realize it will be even harder to start anew and so far removed from all that is familiar. Then, why emigrate? Because, at the end of the day all the money paid in taxes and fees will pay for social services of worth to their lives. They will visit government offices and get their necessary business done without suffering bribes, insults, and ignorance. They will have confidence in the level of education provided to their children. They will eat a meal, whether at home or in a restaurant, without fear of it being contaminated. While new housing projects are ever on the rise, expanding the city limits of Cairo and Alexandria and dotting the landscape along the desert road connecting the two cities, there is little to gain for the ‘average’ Egyptian as foreign investment from wealthy émigrés and Arabs from the Gulf states continue to drive up the housing market. In addition, multi-million pound luxury seasonal beach compounds under development west of Alexandria offer no solutions for the majority of working-class Egyptians. Instead, they serve as daily reminders of how the other half lives. Working-class Egyptians are being excluded and penned-in in their own country. What were once expansive stretches of public-access beaches are now daily reminders of just another space lost in favor of private enterprise meant to serve the interests of the rich and of foreign visitors. With few other options before them, prospective émigrés have the example and knowledge from those that succeeded before them. They now rely on networks of chain migration to gain entry and find opportunities abroad. Then, why Canada? Sixty years ago, when Egyptians first began to emigrate to North America in large numbers, Canada was hardly a preferred destination. At first, dominantly Egyptian Jews and Egyptian nationals of European descent left due to the nationalization projects of Gamal Abd’ al-Nasser’s revolutionary regime. They chose to return to their countries of origin, to the newly created State of Israel, or to New York in search of new opportunities in America.5 Then, they were followed by Coptic Christian and some Muslim graduate students traveling on student visas, lured by scholarships procured through the United States’ Cold War-era Educational Council for Foreign Medical Graduates. Contract lecturers at universities, doctors, and engineers followed, and continued to dream of eventual return. In the 1960s and 1970s, Canada drew more Egyptian immigrants to its expanding post-secondary educational sector and professional jobs in the private sector. Yet still, far more chose the United States over Canada. For many, all they knew of Canada at the time was Montreal. To be more specific, they knew of McGill University and the French connection enforced by Jesuit and Dominican institutions in Cairo and Alexandria. Since then, Toronto has grown in significance for prospective Egyptian émigrés. Particularly since the proportion of French speakers in Egypt has dwindled in recent years. Today, there is a palpable fear of growing xenophobia and anti-Arab rhetoric in the United States and western Europe. Some have related that a Canadian visa would make it easier for them to then pursue opportunities in the United States, Australia, Britain, France, or Germany. As pragmatic migrants, they wish to test the waters and leave open the possibility of future migrations. However, most see Canada as their final destination and dream of its empty spaces, its promises of equitable treatment, and publicized respect for immigrant communities. Today, struggling working-class Egyptians rely on transnational networks of chain migration and media reports in an increasingly globalized world. They view the permanent move to Canada not as a temporary expedient giving them access to education and social mobility, but as an escape; from decay, corruption, and stagnation to a developed city, with sound planning and vital social services. They are searching for stability and security for their families. Finding little work or opportunities to succeed and frustrated with the quality of life, or rather the lack thereof, emigration is now the most viable of their remaining options. In the tense political climate of Trumpism and escalating xenophobia in western Europe, they choose Canada, lured by the promise of a safe haven to raise their children and live in peace. 1. Akram Khater, “Globalizing the Middle East: Migration, Diaspora and Transnational Communities,” Address to the Center For Global and Area Studies, University of Delaware, October 14, 2015. 2. To respect the privacy and confidentiality of participants, no names are disclosed and subjects are referred to as “the driver(s)” throughout. 3. Mahmud (pseud.) interviewed in Ontario, 13 March 2017. 4. While “drivers” were representative of both the Christian and Muslim faiths, Coptic Christians must also contend with escalating fears of persecution. 5. For an engrossing account of the life stories of Jewish and European Egyptian nationals refer to: Liliane S. Dammond, The Lost World of the Egyptian Jews: First-Person Accounts from Egypt’s Jewish Community in the Twentieth Century, (New York: IUniverse, 2007). 6. This case had particular resonance for this individual because Omar Khadr’s parents are Canadian citizens who emigrated from Egypt, his mother originally of Palestinian descent. Confronting Canadian Migration History by Michael Akladios is licensed under a Creative Commons Attribution-ShareAlike 4.0 International License, except where otherwise noted.